Further bringing 3D printed medical models to life, Stratasys is expanding the suite of printers and materials validated by its collaborator Materialise as part of FDA-cleared Materialise Mimics inPrint software. The end result is the most versatile 3D printing system for point-of-care across hospitals and physicians – advancing production of patient-specific, life-like anatomical models for diagnostic purposes in conjunction with other tools and expert clinical judgement. PolyJet multi-material and multi-color solutions validated now include the J750 and J735 3D Printers and the high-performance desktop Objet30 Prime 3D Printer. 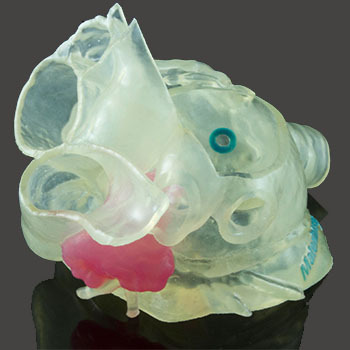 Materialise Mimics inPrint is the first and currently only 3D printing software cleared by the FDA to create anatomical models for patient care. The software is designed to allow physicians and hospitals to leverage 3D printing at point-of-care – building a trusted and reliable source for surgical planning and interdisciplinary communication. The Stratasys’ Objet30 Prime 3D Printer is a cost-effective, desktop platform providing an entry point to hospitals seeking a point-of-care printing solution – without compromising quality, resolution or accuracy. The versatile offering supports a range of anatomical models and applications, including orthopedic, cardiac, neurosurgery and other use-cases for visualization, surgical planning, training and education.